In response to my last post, Fran Snyder, a singer-songwriter based in Lawrence, KS, sent me a link to his website ConcertsInYourHome.com which is a resource for musicians and house concert hosts alike. neighborhoods and music lovers together in a common cause. The music industry is changing and the old business models need to be re-examined if musicians are to thrive in a world where labels no longer control distribution and the economics of playing noisy clubs for tips is increasingly less rewarding. Perhaps musicians can take a lesson from writers who have turned to self publishing in order to reach audiences and have successfully bypassed the traditional publishing industry and its insider network. Very few get rich, but most of the writers I know who have done this have managed to sell books and generate some income. More and more musicians seem to be self publishing also, but what if they really got behind a grassroots effort to augment their income with performances in house concert venues? One musician friend feels that playing for tips is demeaning for a professional musician. How about working for donations? Working for a living always involves having to make choices and being able to draw an audience. Providing background music in a club means that you are always interrupting someone’s conversation. If you are good enough to command the attention of the crowd and willing to overlook the screamers in the front table, you may pull in enough tips and applause to make the day worth while. How about setting up a few house concerts with congenial hosts? Donations are understood to be the price of entry and you get an attentive audience. Your only problem as an entertainer is drawing a crowd through reputation and promotional activity. I would be interested in hearing if there is a down side to house concerts from the musician’s standpoint. Let’s have some discussion on the 21st Century touring model. This entry was posted in Country Living, Expanding Your Opportunities, Music, Simpler Lifestyle and tagged 21st century touring, concerts in your home, fran snyder, house concerts. Bookmark the permalink. I have played several house concerts and have also hosted a 1/2 dozen or so at my store, the Pickin’ Porch. I think they fill an important need in the current music scene. In my experience, they are hosted by people who love and value music and musicians and draw like minded audiences. I have generally found that they pay as good or better than clubs or even festivals and I am able to sell more merchandise (CDs t-shirts, etc). 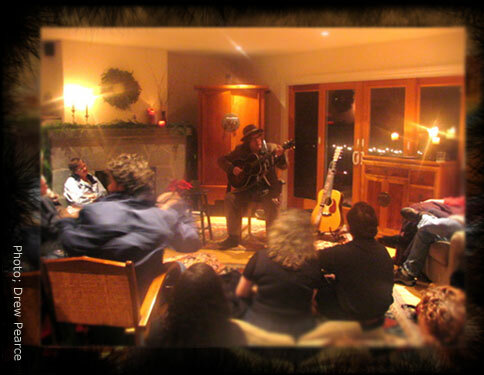 The house concert model has been around for awhile and highly competitive. However, unlike many festivals which now charge fees just to consider acts and then demand reduced performance fees or clubs that offer no guarantees and stiffer percentages, house concerts seem to continue to place the music and those who make it first. My next house concert is on March 1st at Ambrosia Farm Bed & Breakfast. Suggested donation $10. You and your readers are most cordially invited! The date of the show is March 1st at Ambrosia Farm Bed and Breakfast in Floyd. The donation for the concert is 10.00 per person and there will be dessert and drinks served ( included in the price). Show starts at 8 PM features solo acoustic blues and roots music performed on reo-phonic guitar and ukulele. Many tunes from my newest CD will be features. Folks can check out ohpapa.com to hear clips. Reservations are a very good idea as I believe seating is limited to about 20 or 25. Contact Carloine at 745-6363 or ambrosiafarm@swva.net. There is a cooking class that day at Ambrosia as well. The cooking class starts at 5:00 with Natasha Shishkevish, previous Oddfellas chef. the Title of the cooking class is Easy Elegant Seafood. 4 main dishes will be prepared focusing on shrimp and salmon, and 4 sides all paired with wine, followed by dinner. There are 3 people registered so far. The class can accommodate up to 10. The cost of the cooking class and dinner is 75.00 per couple or 40.00 per person.